John Robert Bolton (born November 20, 1948), is an American diplomat in several Republican administrations, served as the interim U.S. Permanent Representative to the United Nations with the title of ambassador, from August 2005 until December 2006, on a recess appointment. His letter of resignation from the Bush Administration was accepted on December 4, 2006, effective when his recess appointment ended December 9 at the formal adjournment of the 109th Congress. Bolton is now a senior fellow at the American Enterprise Institute. The Patas Monkey (Erythrocebus patas) is a ground-dwelling monkey distributed over West Africa, and into East Africa. It is the only species classified in the genus Erythrocebus. Patas monkeys avoid dense woodlands and live in more open savanna and semi-deserts. The Patas Monkey grows to 85 cm in length, excluding the tail, which measures 75 cm. Reaching speeds of 50 km/h, it is the fastest runner among the primates. This monkey lives in groups of about twelve individuals. There is a loose matrilineal dominance rank. The group contains just one adult male. Once juvenile males reach sexual maturity (around the age of 4 years old) they leave the group, sometimes forming all male groups. The monkeys feed on insects, seeds, and tubers. There are two subspecies: the western Erythrocebus patas patas (Common Patas) and the eastern Erythrocebus patas pyrrhonotus (Nisnas). The Nisnas has a white nose, while the nose of the Common Patas Monkey is black. I think perhaps the monkey is actually wearing a fake stache? 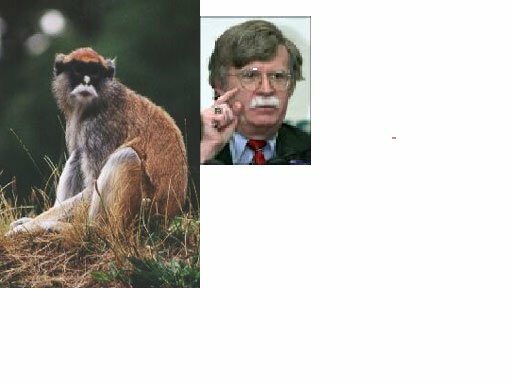 what is more likely; monkey with fake stache or bolton with toupee????? perhaps both??? i still would really like to go with monkey with the fake stache but see your point about the toupee….